View of Surf Avenue. See roller coaster tracks on the right and entrance to the "Loop the Loop". There used to be a "Dreamland" section to the Coney Island amusements. This is its entrance. 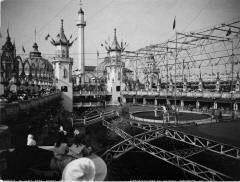 "Shooting the Chutes"
at Dreamland (1905). 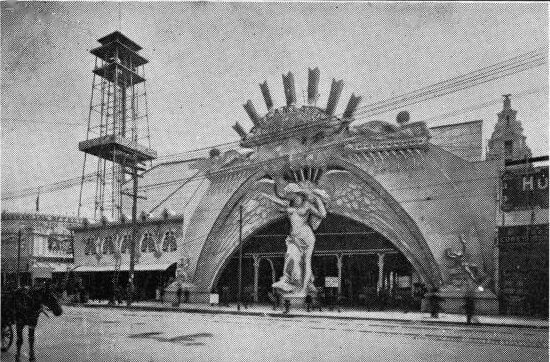 Inside Luna Park, (1905). Electric Towers at night, (1905). The Coney Island that many of us have known and grown to love in our youth is, without a doubt, one of the world’s most famous seaside attractions. An island less than five miles long and half a mile wide, it has drawn millions upon millions of visitors seeking rest and relaxation for as long as anyone of us can remember. 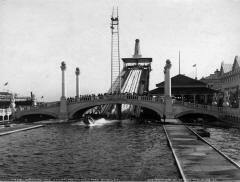 Who can ever forget Steeplechase Park, the Cyclone roller coaster, the Wonder Wheel and the Parachute Jump? 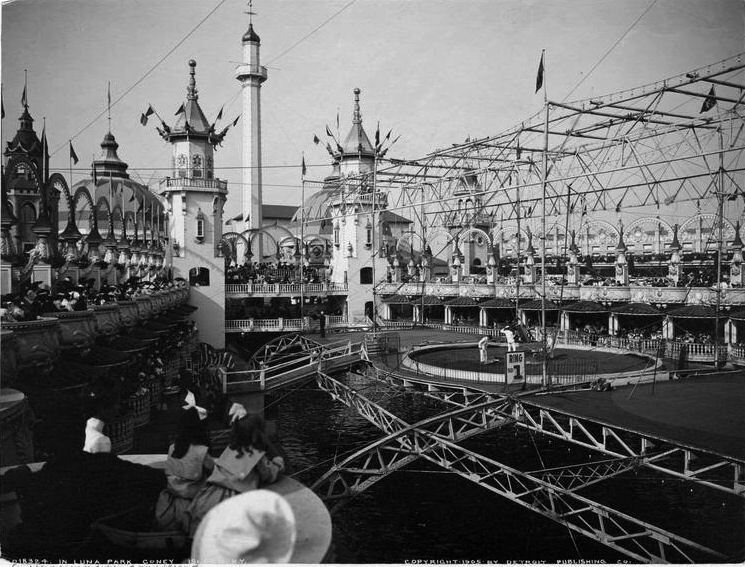 Of course, Coney Island did not start out this way…. Located at the southern tip of Brooklyn, the area we now know as Coney Island was discovered by Henry Hudson in 1609, who was sailing under the auspices of the Dutch East India Company in search of spices. When the Dutch finally arrived at these marshlands (it was bought for some wampum and a couple of guns! ), they made it part of their New Netherlands colony and renamed it "Conye Eylant," "conye" being their name for the many rabbits that had inhabited the area at the time. Mostly, this collection of small islands was a sandbar that the Dutch used for their livestock to graze on, until they transferred the title to an English Mennonite in 1643, who then named this area Gravesend. 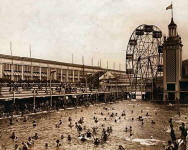 For more than two centuries, Coney Island was used for little more than grazing land. In 1824 the supervisor of Gravesend and his brother built a toll causeway (Shell Road) across the Coney Island Creek. This led directly to an inn that they had built in hopes that they could attract those residents from New York City who might want to escape their sweltering confines and spend some time "bathing" in the sea. Later, a local schoolteacher built a second small inn. Of course, at that time there were no buses or subways to bring visitors to Coney Island, so they hired stagecoaches to bring their guests there! Years later a small pier was constructed and daily ferry service was started. A tented pavilion was built, and dining, dancing, and bathing was available to all. This facility was generally meant for those who would come only for the day for a bath, or just for a frolic. In contrast, a number of inns were built in hopes of attracting those a little more well to do, who would we willing to spend more of their leisure time and money there. 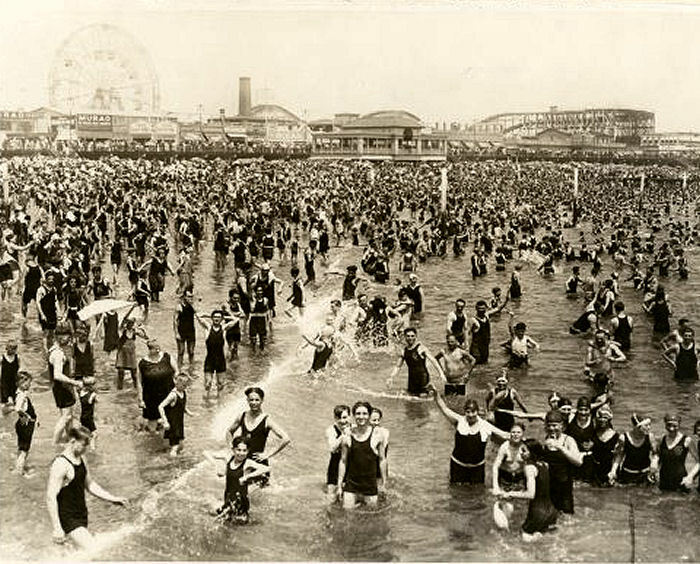 Prominent literary figures remarked positively of their visits to Coney Island. Walt Whitman was inspired by his visit, accompanied by sixty of his friends in celebration of the plans to build a new Brooklyn City Hall. He wrote of the beautiful vistas he saw as he strolled along the beach. 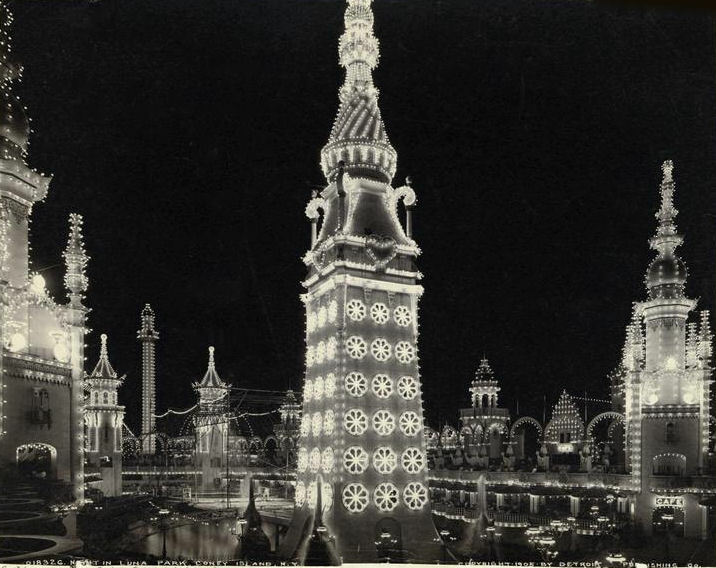 After a time, Coney Island became quite popular, and other notable visitors came there too. Herman Melville came in 1849. Washington Irving and Edgar Allan Poe visited too. In 1850, statesmen John Calhoun, Henry Clay and Daniel Webster enjoyed their time there. Even P.T. Barnum visited, in the company of songstress Jenny Lind. 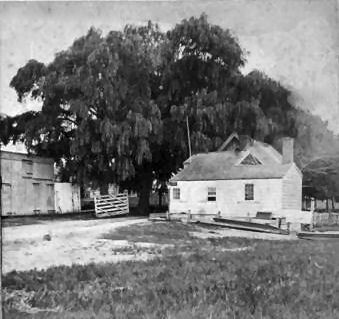 photo, left: The toll gate beneath the willows, on the Shell Road. [Trip to Coney Island.] ([1865?]-1919). Courtesy of the New York Public Library, Digital Gallery. With the success of the Pavilion at the western end of the island and the various inns at Gravesend, it was shown that those of every class could have a grand time there. 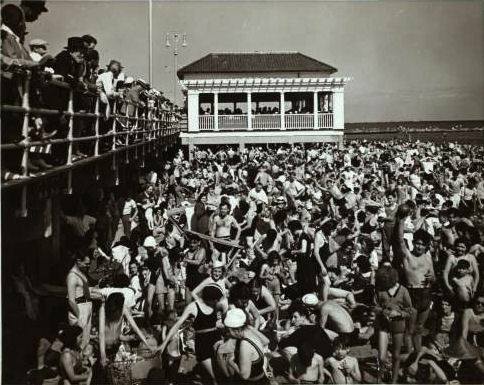 However, A large problem that had to be overcome was how to transport the increasing numbers of people from various parts of the City to the various points of interest at Coney Island. Advances in transportation would play an important part in the development of Coney Island as well as other parts of Brooklyn. 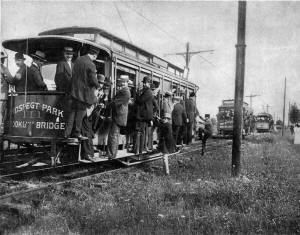 This transport was offered by the "Coney Island and Brooklyn Railroad," requiring one to change cars at Prospect Park. Contrary to what you may think, these cars were driven by horses, and the trip took two or three hours each way! 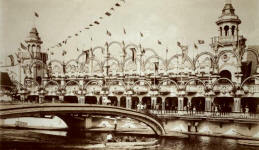 In 1867, William Engeman purchased Brighton Beach, and subsequently built Coney Island’s first ocean pier. In 1871, Charles Feltman opened a restaurant and café; this is significant because he introduced (but did not discover) the frankfurter (not named the "hot dog" until 1906!). In the decade that followed the end of the Civil War, much change occurred throughout the nation. A great deal of wealth created rapid industrialization in urban areas, and New York City and Brooklyn were no exception. With the industrialization came jobs and a need for large numbers of workers. Thus came the large increase in population, including thousands of immigrants that needed to find jobs. The workers that filled all these new jobs needed a place to spend whatever leisure time they had. What better way to recreate than to spend a day cooling off than a summer’s day at the beach? How many places were there like this that were open to all classes of people, where they could go for clean air, dining, dancing and bathing in the sea? Much of the area’s development was paid for by railroad men and entrepreneurs savvy enough to exploit this new interest in ocean bathing. photo, left: A holiday crowd bound for Coney Island, Ulmer Park and Bath Beach, 1899. 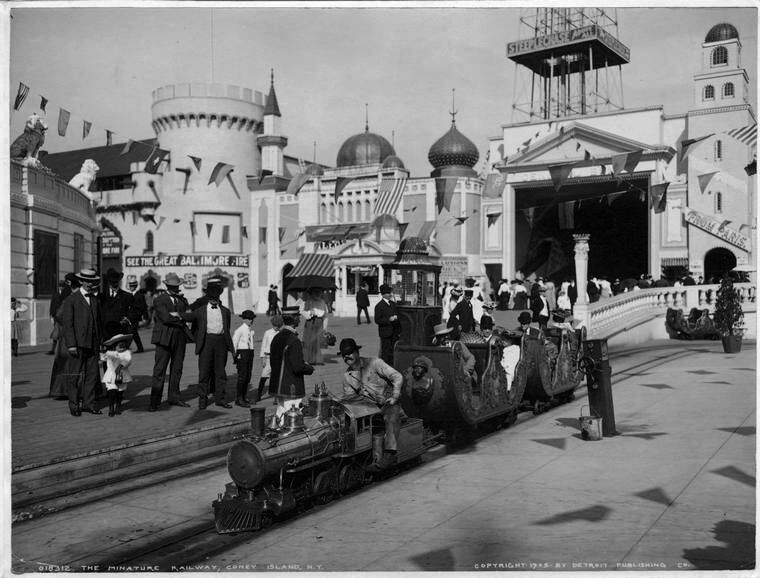 In 1876, fourteen years after horse-driven transportation was first offered as a means of public transportation to Coney Island, steam-powered locomotives were employed that would deposit travelers at the doorstep of a fancy, full-service hotel. 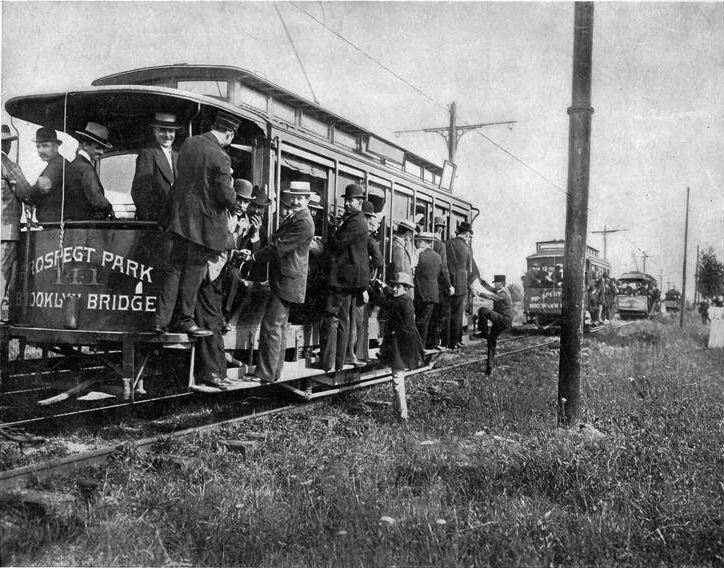 The Prospect Park and Coney Island Railroad offered rides that originated from various points in Brooklyn and the East River ferry landing. This was done by way of streetcars that took passengers to Prospect Park, where they would have to disembark their horse-drawn streetcars and board the steam-powered trains. 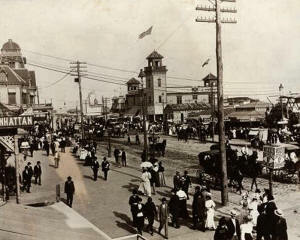 The very same year, the year of America’s centennial, the Ocean Park Roadway (another toll road) opened, allowing for transportation between Prospect Park and Coney Island. This displeased the property owners in Coney Island, for now their area would be inundated by the teeming masses of fun seekers from the City. 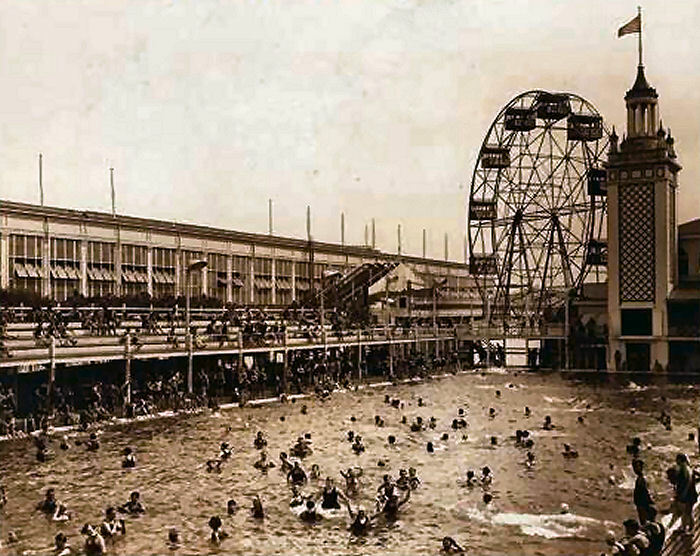 Certainly by this time, Coney Island was becoming a very popular seaside resort. Between 1876 and 1881, four railroad lines ran to Coney Island and another large pier was built. In 1879, Coney Island had its first aquarium, and a year later, the Sheepshead Bay Racetrack began its operation. During this year, the Brighton Beach Race Track opened. 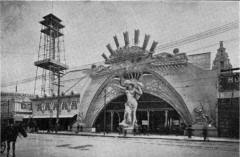 The next year, the Surf Theater, Coney Island’s first theater, made its debut. 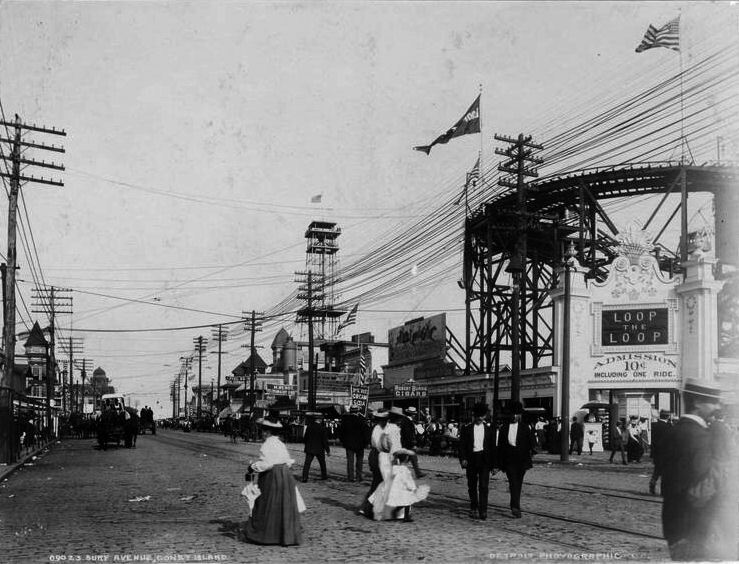 In its early days, Coney Island also had beer gardens and gambling and concert saloons and, with all of this, came pickpockets, thieves and scam artists. Of course, with the increasing popularity of the area, more people were seeking housing and business opportunities there, and with its development came the opening of new streets, e.g. Coney Island in 1876, running from Ocean Parkway to Coney Island Avenue, and Surf Avenue in 1879, which ran from Brighton Beach to West Brighton. 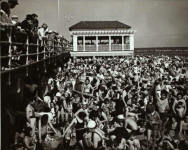 Different areas of Coney Island attracted different crowds. Manhattan Beach was developed by Austin Corbin, who hoped to attract the wealthier folk from the surrounding area. He built an elegant resort. Brighton Beach was built more for the middle class of Brooklyn. The poorer classes congregated around West Brighton. 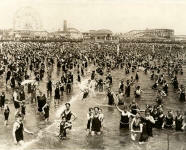 As more and more men, and even young working women, had more free time, Coney Island increased in popularity. 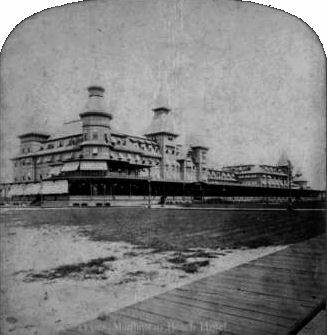 photo, left: Manhattan Beach Hotel. photo, right: Music Stand, Manhattan Beach. [American views, Coney Island.] ([1865?]-1919). Courtesy of the New York Public Library, Digital Gallery. For those of you who were roller coaster enthusiasts, there were plenty of roller coasters that operated there over the years. 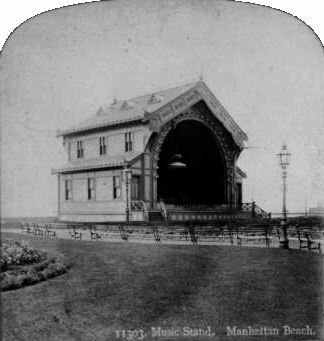 The first one built in Coney Island was in 1884. A second one was transported from New Orleans, and opened on the Iron Pier. 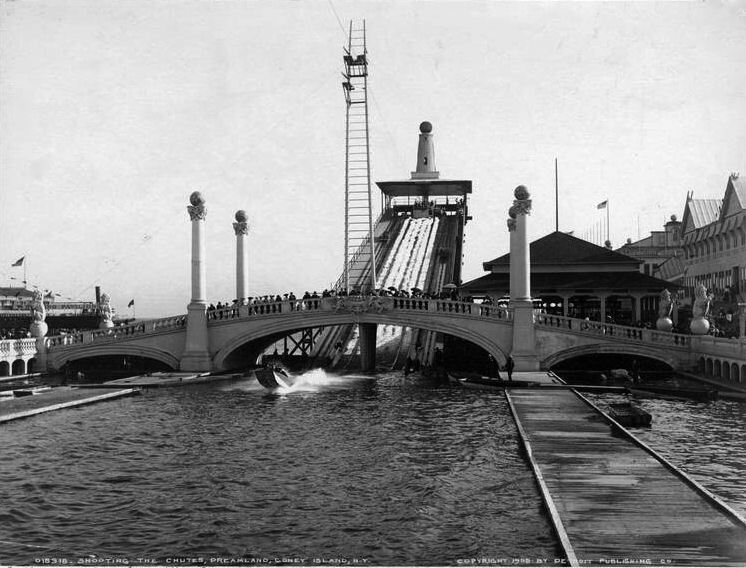 The "Loop-the-Loop" opened in 1901 and "Drop the Dip" opened in 1906, but this one burned down when Coney Island had a fire (there were a number of them) that burned thirty-five acres of structures there a year later. It was subsequently rebuilt in 1908. 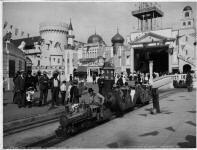 The "Thunderbolt" was built in 1925 over the Kensington Hotel, but eventually closed in 1981.
photo, left: Transportation - Horses - Carriages - Wagons - Coney Island [when horse carriages and bicycles were popular mode of conveyance in Brooklyn] (1899? ).